When I said I went a completely different direction after The Bell at Sealey Head, I meant it. I went to a graphic novel about a fictionalized group of Canadian comic book collectors, and about one of those collectors in particular, a mysterious man by the name of Wimbledon Green. I recently recommended this book to my friend Faith, and fishy promptly suggested that I should recommend something else by Seth, not this. 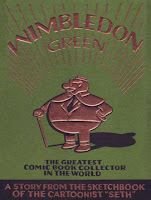 Wimbledon Green is not his best work, I am told, not his most polished, not his most beautiful, not his most coherent. In fact, Seth himself tells us this; it's clear, from the foreword that should probably be an afterword, that Seth sets exceedingly high standards for himself. It's a story taken from his sketchbook, an experiment. Because of this, I add to this review the caveat that this may indeed not be Seth's best work. But it is an excellent little book, a really interesting work, and a really lovely piece of art. It stands on its own, all disclaimers aside. I think I first have to mention the artwork. Seth has a pretty distinctive style. 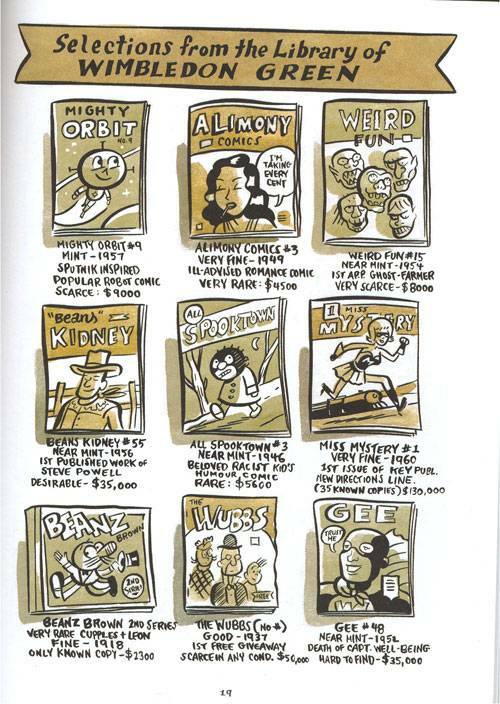 You may have seen it before; he designed the Peanuts anthologies, for example, and the Doug Wright anthology. It's got a sepia-toned nostalgic flavour, and an economy of line that belies how intricate and beautiful a finished panel is. The world created by his pen is consistent, complete and wide, much larger than the scope of the story he tells in it. His character work is unique and distinctive, and he knows how much he needs to show in a panel background in order for the reader to build a setting. So, what is Wimbledon Green? Well, it's a tongue-in-cheek look at the world of comics collecting, often affectionate but also somewhat cynical. There are few entirely likeable characters -- even the titular fellow is not as charming or likeable as one might think. It's a story told in vignettes, a brief "biography" of Wimbledon Green as told by many people who knew him or knew of him, with some live action from Green's life plus a few other items of note relating to Green tossed in. It's put together in such a way that there's never a true narrative, but the larger picture emerges gradually. The added complication is that the multiple narrators are completely unreliable; it's difficult if not impossible to separate out truth from fiction. The unreliable narrator is a storytelling convention I normally dislike, but here it works for me incredibly well. The multiple unreliable narrators here add a very active component to reading. The reader analyzes things carefully: does this person have a vested interest in being honest or dishonest? Does this person strike the reader as trustworthy? Is the character who seemed trustworthy previously now starting to seem less so? Even when we finally get to Wimbledon's own telling of his story, one feels there's a lot of omissions; whether those omissions are conscious on his part is another question for the reader to puzzle over. In the end, we never feel like we have a good handle on Wimbledon Green, much the same as all the other narrators, despite the fact that we do have more information than any of them. 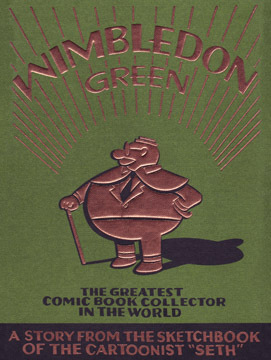 This may sound unsatisfying, and in some ways it is, but it's fitting: Wimbledon Green is a man of mystery, and he remains that way. I can't quite finish the review without mentioning Jonah. This character is a dead ringer for Seth in appearance and certain foibles (exaggerated nostalgia for past eras, for example.) Though, I would hate to suggest that Seth is as thoroughly unpleasant as Jonah is. I don't know the author, but Jonah's a sneak, a cheat, an opportunist who has a deluded view of himself and the rest of the world. The rest of the characters have very little nice to say about him. It's an interesting choice for the author to put himself in there in such a way, but not without its humour. Put together with his foreword/afterword, and one begins to hypothesize a case of imposter syndrome, in the same way one has spent the rest of the book reading between the lines. I am sure this is all quite deliberate. I'd like to recommend this book as an entree into Seth's work, though the author himself surely wouldn't thank me for it. I'll read more of his stuff, though from the snippets I've seen of his other work I suspect the melancholy that is merely hinted at in Wimbledon Green is out in full force in some of his other stuff. I am not always a fan of that sort of deep sadness without some sort of levity, and I thought that this book had a nice balance. fishy's been re-reading this book, and published a much better, more in-depth blog entry on it than I have here. His point about Wimbledon Green being a superhero himself is well-made and I feel a little ... abashed, let's say, that I missed it myself the first time around. This looks fascinating! Not sure how easy it would be to find here (probably not at my library), but I'll put it on my list. Thanks! Darla, the super-sad thing is that some of Seth's books aren't even in my library, and he's actually quite local to us. He's not hugely well-known in mainstream circles (I wouldn't know about him except for my husband, and I'm not exactly mainstream) so it's not surprising that his stuff is a little harder to find. Good luck!